This entry was posted in Steelers History and tagged AFC Central, Bennie Cunningham, Bill Cowher, Bubby Brister, Chuck Noll, Dan Rooney, Dwight Stone, Franco Harris, Gary Anderson, Greg Lloyd, Merril Hoge, Mike Tomczak, Neil O'Donnell, Pittsburgh Steelers, Steelers vs. Cardinals, Steelers vs. Eagles, Steelers vs. Oilers, Terry Bradshaw. Bookmark the permalink. Wasn’t Buddy a DC in Minnesota in ’76? Or just a D-line coach (sources vary)? If he was their DC, that would make it 5-1 vs Steelers who Vikings beat on MNF in Week #4, just before Steelers went on that classic surge! Yes, Buddy was in Minnesota in ’76, but he was defensive line coach per Pro Football Reference. 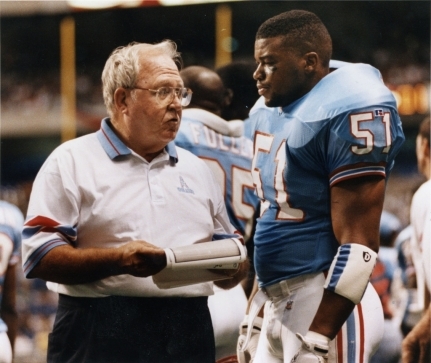 Suffice to say, I am not a fan of Buddy Ryan, but he gave the Steelers fits, no matter how you look at it.